Increased IGF-1 levels and Benefits Show Effectiveness of HGH Plus IGF-1 & IGF-2! Client's IGF-1 Level Increased 387% in 3 Months! Lisa, it was a pleasure speaking with you yesterday. I was first diagnosed with my pituitary problem when I had a positive pregnancy test which I ended up not being pregnant. I had gained nearly 40 lbs in just a few short months. Little did I know how my life would change thereafter. The medication (Parlodel) they first put me on kept me in bed because it made me so sick. I began to have so many health problems. I saw Dr. Lucy Kormeier, Endocrinologist in Houston Texas. She ran lab work and that was when I was first diagnosed with low IGF-1 (see lab work). 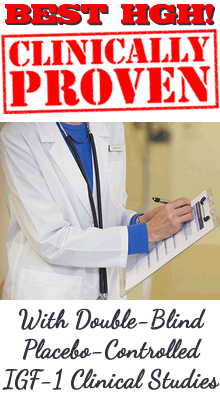 She ran an extensive test for HGH which the insurance company did not want to pay. Throughout the test my IGF-1 levels remained extensively low (in 20's and 30's) but when the nurse called me she said my HGH responded normally and did not address the IGF-1. I was placed on Dostinex but nothing was done about the low IGF-1. My first month on Dostinex I lost 17 lbs which was great. I later saw Dr. Shari Fox, an Endocrinologist in The Woodlands. At that time I had an MRI and lab work. Again, Dr. Fox showed that I had low IGF-1 and wanted me to get my original lab work from Houston so she could build a case so that the insurance company would pay for injections because the insurance company does not consider this medically necessary--they just don't have a clue. Her concern with injections though was that it could make the pituitary tumor grow. So, I was desperate and began researching products on the web. I came across HGH-Pro and read all the information your web site provided. I wanted to give it a try but being a single mom of a 16 year-old, I had to wait until I received my refund from my income tax. In mid February I ordered a Women's Anti-Aging Combo with HGH Plus IGF-1 & IGF-2. I began taking it and in early May was ordered lab work. To my wonderful surprise my IGF-1 levels according to the range provided was normal (see below). All information I have shared is true and can be verified. I cannot even begin to thank you for this wonderful product and for caring for those of us who truly need this. Please know that I am freely sharing my testimony and information with you because I am proof that this product does increase the IGF-1 levels. Again, thank you so much for your care and concern! *Our ProBLEN HGH Plus IGF-1 & IGF-2 product increased this client's IGF-1 level from 39 to 151 in only 3 months, that's a 387% increase! Mr. Schwic is a 56 year old customer of ours. He used our progress form to monitor his benefits while taking our HGH Plus IGF-1 & IGF-2 product during the first 7 weeks.